Fossil Life in ALH 84001? These pages are an explanation of the Science paper of Dr. David McKay and his co-workers, where they give evidence that martian bacteria may have lived in the martian meteorite ALH 84001. Ive tried to organize and review their evidence that ALH 84001 contains fossils and traces of ancient martian life, and also tried to outline some counter-evidence and some likely questions about the evidence. My intention is to present the work of McKay and co-authors even-handedly and nonjudgmentally. Allan H. Treiman, Lunar and Planetary Institute. McKay and his co-workers DO NOT claim that they found live martian bacteria; they only claim to have found evidence of dead, fossil bacteria and chemical traces that might have come from bacteria. They have no evidence for martian organisms more complicated than bacteria--no eucaryotes (cells with nuclei), no multicelled creatures, no plants, no animals, and no little green men. Before talking about their evidence for martian life in ALH 84001, McKay and co-workers need to establish some preconditions. These are not evidence for life, but evidence that life (as we know it) could be possible, and that the life could be martian. There is little doubt now that ALH 84001 is from Mars. Life as we know it cannot form, multiply, or survive without liquid water. Liquid water acts as a solvent or catalyst for almost all the chemical reactions of life. So, McKay and co-workers have to show that ALH 84001 was infiltrated by liquid water, at least once, while on Mars. As all of McKays evidence for martian life is inside the carbonate mineral globules in ALH 84001, it is critical to show that the carbonate mineral globules are martian and that they were formed by liquid water. There is little doubt that the carbonate mineral globules formed on Mars. The globules are much older than the meteorite impact event that launched ALH 84001 from Mars on its way to Earth (see Carbonate Age and Cosmic Ray Exposure Age. In addition, oxygen and carbon in the carbonate minerals have isotopic compositions that are characteristic of Mars (Romanek et al., 1994b; Grady et al., 1994; Jull et al., 1995). Most researchers think that the carbonate-rich globules were deposited by liquid water, despite the lack of water-bearing minerals like clays or rust (Romanek et al., 1994b; Treiman, 1995; Jull et al., 1995; Wentworth and Gooding, 1995). On the other hand, Harvey and McSween (1996) reported evidence that the carbonate globules grew at very high temperatures, >650ºC (>1200ºF). If the carbonate mineral globules were so hot, it is very unlikely that they had anything to do with life. However, Harvey and McSweens evidence for high temperature could also be a result of bacterial action. Bacteria are able to do amazing things, sometimes to form minerals that have no business being there, says Dr. McSween in an Aviation Week article (Aug. 12, 1996; page 26). This point, that the carbonate mineral globules formed in Mars ancient past, is not really critical to the evidence for life. But an ancient age makes life more plausible. If, as McKay and co-workers report, the globules are 3.6 billion years old, they formed when Mars atmosphere may have been much thicker than it is now, when temperatures were much warmer, and when liquid water could have been abundant. The surface of Mars now appears to be a sterile, frigid desert, most inhospitable for life that requires liquid water. Showing that the carbonate globules formed when liquid water was abundant makes it more plausible that they might contain traces of life. B. The Evidence for Ancient Martian Life in ALH 84001. McKay and his co-workers describe three kinds of features in ALH 84001 that they interpret as evidence for ancient martian life. These features are all in (and near) the carbonate mineral globules, which McKay and co-workers believe to have formed on Mars from liquid water. In the carbonate globules of ALH 84001, McKay and his co-workers found microscopic shapes that resemble living and fossil bacteria on Earth; microscopic mineral grains like some produced by living and fossil bacteria on Earth; and organic chemical compounds that resemble the decay products of bacteria on Earth. McKay and co-workers observed elliptical, rope-like, and tubular structures in fractures in the carbonate mineral globules; they interpret the structures as possible fossil bacteria. These structures are so small, each only 20 to 100 billionths of a meter across (or nanometer, abbreviated nm), that they could only be seen with an advanced electron microscope. Figures 6a and b of their paper show these elliptical and sausage shapes, as do two other images they presented at the NASA press conference. Even though the shapes look like bacteria, they may not actually be from bacteria. To show that the shapes could really be fossil bacteria, McKay and co-workers have tried to show (1) that the bacteria shapes are actually the sizes and shapes of known living organisms; (2) that the bacteria shapes are really part of the rock, and were not produced accidentally while they prepared the sample for study; and (3) that the bacteria shapes are not Earth bacteria that somehow wiggled into ALH 84001 while it was in Antarctica. a. It turns out that many Earth bacteria have essentially the same sizes and shapes as do the structures that McKay and co-workers found in ALH 84001, as shown in their Fig. 6. These minute Earth creatures, the nanobacteria, were first discovered living inside rock, and have since then been found inside rocks from many different places and environments. They have even been found growing happily in volcanic rocks (similar to ALH 84001) from five kilometers beneath the surface of eastern Washington state. Even though the bacteria-shaped structures are the same sizes and shapes as some Earth bacteria, Dr. W. Schopf (an eminent paleontologist and expert on the earliest life on Earth), cautioned that the structures may not be bacteria. He warned that inorganic processes can sometimes produce elliptical and tubular structures, and that ancient bacteria on Earth were hundreds of times larger than the tubes andsausages in ALH 84001. Even more, he warned that finding bacteria-shaped structures isnt enough; to accept that these shapes are fossils, hed want to see evidence of cell walls (which keep live bacteria apart from their surroundings), evidence of reproduction (bacteria shapes dividing or budding), evidence of growth (bacteria shapes in a range of sizes, with the largest beginning to divide), and evidence of colonies of cells. b. Electron microscope images often show features and structures that have nothing to do with the sample, like dust, cleaning residue (high-tech soap scum), and the glue (epoxy) used to mount the sample. Also, samples for their electron microscope study need to be coated with metal or carbon; McKay and co-workers applied a very thin coating of gold and palladium. Sometimes this coating can obscure or change surface features. McKay and his co-workers tested for these kinds of artificial features by examining other rock samples besides ALH 84001 that had been treated exactly the same as the ALH 84001 samples with the bacteria shapes. McKay and co-workers did not see the bacteria-shaped features on the other samples, and did not see them on samples of ALH 84001 without carbonate mineral globules. The found that the gold-palladium coating did leave a very fine cracked surface on the samples, but much smaller than the bacteria-shaped objects. So, they conclude that the bacteria shapes in ALH 84001 were not accidental products (artifacts) of sample handling and preparation. It is still possible that the bacteria shapes are artificial, and that McKay and co-workers did not consider all possible kinds of artifacts. In particular, there is some concern that the rounded bacteria shapes were produced accidentally during gold-palladium coating, or are thick gold-palladium sheaths surrounding much smaller, real objects. c. Finally, McKay and co-workers need to show that the bacteria-shaped features were not just terrestrial bacteria. 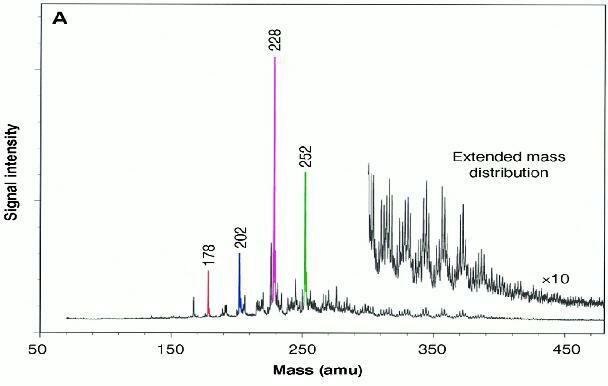 The bacteria-shapes in ALH 84001 are too small for direct chemical or biological analysis with the methods McKay and co-workers had available. So, they looked at other Antarctic meteorites, thinking that if bacteria could enter ALH 84001 in Antarctica, bacteria should certainly be present in other meteorites. McKay and co-workers found no evidence of bacteria in other meteorites from the same area where ALH 84001 was discovered, so they conclude that the bacteria-shaped structures in ALH 84001 are not Earth bacteria. It remains possible that the bacteria shapes are Earth bacteria. Although McKay and colleagues found no bacteria shapes in three other Antarctic meteorites, they caution us that these other meteorites are not exactly like ALH 84001. Particularly, the other meteorites did not contain carbonate mineral grains. If it happened that a kind of Earth bacteria lived only on carbonate minerals, it could grow in ALH 84001 and not in the other meteorites. McKay and co-workers found microscopic mineral grains in the carbonate mineral globules of ALH 84001, grains that are similar to some produced by bacteria on Earth. So, McKay and co-workers suggest that these mineral grains in ALH 84001 may have been produced by martian bacteria. They do note, however, that similar mineral grains can be produced by inorganic processes, without any assistance from life. To show that the mineral grains might be products of martian bacteria, McKay and co-workers present evidence that (1) the mineral grains formed on Mars; (2) the mineral grains have chemical compositions, crystal structures, sizes, and shapes like biologically produced grains on Earth; and (3) the different microscopic mineral grains, and the larger mineral crystals they occur in, are not likely to have formed by inorganic processes, without assistance from life. a. The microscopic mineral grains are almost certainly from Mars. They are inside the carbonate mineral globules, which did form on Mars. There is little doubt that the microscopic mineral grains, inside the carbonate mineral globules, formed on Mars. b. McKay and co-workers analyzed the chemical compositions and crystal structures of the microscopic mineral grains by transmission electron microscope (TEM). The three minerals they identified (magnetite, pyrrhotite, and greigite) have all been found on Earth as products of biological activity. Some bacteria make magnetite to help them tell where they are going, just like a magnet in a compass. The other minerals, both iron sulfides, may be waste products. And some bacteria produce grains of iron oxide and iron sulfide simultaneously. From the electron microscope images given by McKay and co-workers (Figs. 4a, 4b, and 5, the mineral grains they identified in ALH 84001 are very similar in size, shape, and structure to some grains produced on Earth by bacteria. The mineral grains in ALH 84001 do look very similar to the ones made by terrestrial bacteria. However, similar grains can be made by nonbiological processes, a fact that McKay and co-workers readily bring forward. It is also possible that McKay and co-workers analogies to Earth bacteria are misleading. For instance, the grain of greigite shown in (Fig. 5c above) is from a bacterium in a plant root on Earth. If formation of greigite is significant to the interaction of the bacterium and its plant host, then its formation is probably irrelevant to Mars. Similarly, magnetite grains are secreted by some Earth bacteria so they can follow the Earths magnetic field. Mars now has hardly any magnetic field, so magnetite grains would be useless now to a martian bacterium, except possibly as a waste product. It is completely unknown whether Mars had a magnetic field at the time when the carbonate mineral globules formed. c. Recognizing that biological or nonbiological processes could produce any of the microscopic mineral grains individually, McKay and co-workers looked to see if nonbiological processes could have produced the groupings of microscopic grains together with their host minerals. The most important grouping of these grains is in patches inside the cores of the carbonate mineral globules. There, grains of iron oxide mineral (magnetite) and an iron sulfide mineral (greigite) sit in patches of porous-looking magnesium carbonate. McKay and co-workers infer that this grouping of minerals is very unlikely without intervention from living organisms. First, they interpret the porous look of the veinlets to mean that the carbonate minerals were partially dissolved, leaving holes behind. To dissolve the carbonate, the veinlets must have formed from acid water. But magnetite + greigite can only form nonbiologically from very alkaline (= not acid) water. If the water were acidic, the magnetite and greigite would have dissolved or appear partially dissolved, which they do not. So, McKay and co-authors say that the minerals magnetite + iron sulfides + magnesium carbonate could not have formed nonbiologically, and so must have been a result of biological processes. This argument is subtle, and rests on interpretations of ambiguous textures and minerals. The porous zones could represent magnesium carbonate that was dissolved out, but could also represent another mineral that was dissolved out, for instance a water-soluble mineral like salt. Also, although it may not be significant, the identification of greigite is not certain. These grains decomposed while they were being analyzed (by transmission electron microscope), so their actual chemical composition, structure, and stability in acid or alkaline solutions is not certain. McKay and his co-workers found very small quantities of organic molecules near and in the carbonate mineral globules in ALH 84001. These molecules, called polycyclic aromatic hydrocarbons or PAHs, are a group of chemicals with similar structures; the only PAH that might be familiar to a non-chemist is napthalene, the chemical in mothballs. PAHs can form during decomposition of bacteria, but can also form in many other ways. In fact, PAHs are abundant in the carbonaceous chondrite meteorites, which are from the asteroid belt and did not ever contain life as we know it. 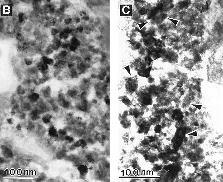 McKay and co-workers try to show that the PAHs in ALH 84001 are derived from ancient martian bacteria by showing that they (1) are not contamination from laboratory procedures, (2) are not Earth PAHs that entered the meteorite while it was in Antarctica, (3) are not like PAHs in other meteorites (which have nothing to do with life), and (4) are consistent with decomposition of simple bacteria. a. PAHs form easily, in small quantities, from many human and laboratory activities. For example, PAHs are relatively abundant in burnt meat, and are the prime suspects in its supposed carcinogenic properties. So it is very important to be sure that the PAHs in ALH 84001 were not accidentally put there during its handling and laboratory study. To ensure that the PAHs in ALH 84001 really belonged there, McKay and co-workers took PAH-free objects (glass slides) through the identical handling and analysis procedures they used for ALH 84001. McKay and co-workers could detect no PAHs that came from their handling and analysis procedures. Then, they exposed meteorite samples, with and without PAHs, to the same handling and analysis procedures used for ALH 84001. Again, there was no evidence that that PAHs were added onto the meteorite samples. McKay and co-workers seem to have shown that the PAHs in ALH 84001 did not get in during laboratory handling or chemical analyses. b. It is possible that the PAHs in ALH 84001 got in while the meteorite was in Antarctica. After all, PAHs are relatively abundant on Earth as natural organic products and from fire. McKay and co-workers applied a number to tests to show that the PAHs are not from Earth. If the PAHs in ALH 84001 were from Earth, one might expect that they would be more abundant near the meteorites surface, and less abundant deep inside. On the other hand, if the PAHs were extraterrestrial, they should have been vaporized away from the meteorites surface during its fiery descent through the Earths atmosphere. McKay and co-workers tested these ideas by measuring the abundances of PAHs inward from the outside surface (the fusion crust) of ALH 84001. They found (in Fig. 1b of their paper that the abundances of PAHs increased as they worked in toward the center of ALH 84001. This increase inward suggests that the PAHs were already in the meteorite before it came through the Earths atmosphere. Today, the principal sources of PAHs on Earth are anthropogenic emissions, exhaust and smoke from burning fossil fuels and from industrial processes. McKay et al. show, however, that the specific PAH chemicals in ALH 84001 are not the same as those in the Earths atmosphere. Particularly, sulfur-bearing PAHs are abundant in the Earths atmosphere, but undetectable in ALH 84001. McKay and co-workers also note that PAHs were much more abundant in the areas they analyzed in ALH 84001 than in ice from Greenland that formed before the industrial revolution. From this, they infer that the PAHs in ALH 84001 are too abundant to have come from pre-industrial Earth sources, and so must be extraterrestrial. McKay and co-workers seem to have shown fairly convincingly that PAHs in ALH 84001 were there before it landed on Earth. 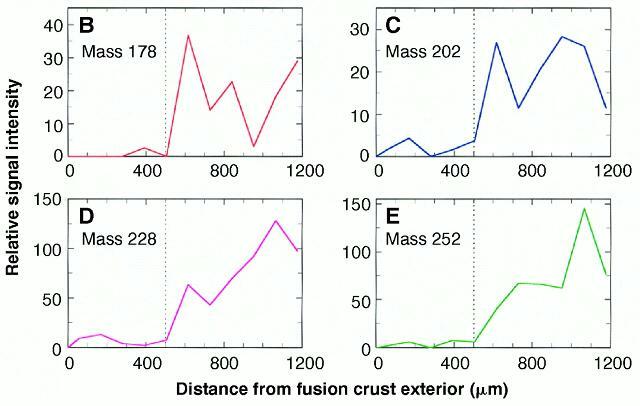 The decrease in PAH abundances near the fusion crust suggests that ALH 84001 contained these PAHs before the fusion crust formed. Because fusion crust marks ALH 84001s descent to Earth, the PAHs would be preterrestrial, and most probably martian. However, it is still possible that the PAHs formed on Earth, and that their decreased abundance near the fusion crust depends on some subtle change in the minerals or structure of ALH 84001 near its fusion crust. c. PAHs are abundant in a few other types of materials in the galaxy: carbonaceous chondrite meteorites, interplanetary dust, and interstellar dust grains. If the PAHs in ALH 84001 are related to ancient life, they should not be like the PAHs in the any of these other materials, which formed without any assistance from life (at least as we know it). McKay and co-workers found that the PAH molecules in ALH 84001 are not similar at all to those in most meteorites and in interplanetary or interstellar dust. The PAHs in ALH 84001 are similar to those in one class of meteorites, but still sufficiently different that they could not be related. It seems fairly sure that the PAHs in ALH 84001 are not like those in known meteorites, cosmic dust, or interstellar dust. It is, of course, possible that there were other, unsampled sources of PAHs in the solar system or galaxy that dumped PAHs onto Mars early in its history. But without evidence for other sources of PAHs, it seems simplest to believe that the ALH 84001 PAHs originated on Mars by peculiarly martian processes. d. Finally, McKay and co-workers want to show that the types of PAH molecules in ALH 84001 are like those that form on Earth from the decomposition of bacteria. The PAHs in ALH 84001 contain only a very small fraction of the enormous variety of PAHs that occur on Earth (Fig. 1a). McKay and co-workers say that a limited variety of PAHs is just what would be expected, and has been observed on Earth, from the natural breakdown of simple living organisms. McKay and co-workers have not demonstrated that the variety and abundances of different PAH molecules in ALH 84001 is actually what would form during the breakdown of simple living organisms. There may also be simple inorganic processes that could produce the limited variety of PAHs seen in ALH 84001, without any recourse to living organisms. To summarize, the Science paper of McKay and co-workers leaves many unanswered question. As they forthrightly state, their paper is NOT PROOF OF LIFE ON MARS. Their paper presents evidence that, on its surface, is consistent with ancient life on Mars; McKay and co-workers believe that the evidence is more consistent with life on Mars than any other explanation or explanations. Almost all of their conclusions can be disputed and will likely be disputed. From my perspective, their strongest conclusion is that ALH 84001 contains polycyclic aromatic hydrocarbons (PAHs) that formed on Mars. These PAH molecules may be related to martian micro-organisms, as McKay and co-workers suggest. The PAHs might also have formed without assistance from living organisms, in what might be called a prebiotic organic chemistry. Proof of a prebiotic organic chemistry system in Mars would be nearly as exciting as proof of life itself. 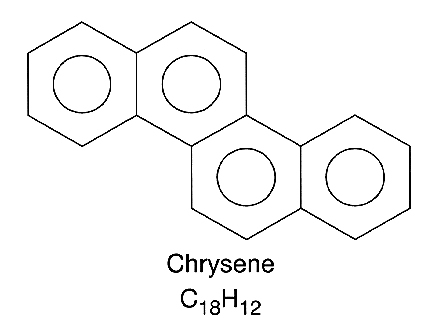 The organic compounds that McKay and co-workers found in ALH 84001 are called polycyclic aromatic hydrocarbons, or PAHs for short. These compounds form easily by heating almost any organic or carbon-rich material; for instance PAHs form when red meat is burnt, and they have been found to contribute to causing cancer. Heres what PAHs are, starting with the H.
H -- Hydrocarbon. Hydrocarbons are chemical substances made entirely (or almost entirely) of the two chemical elements hydrogen and carbon. Gasoline and oil are both hydrocarbons. A -- Aromatic. 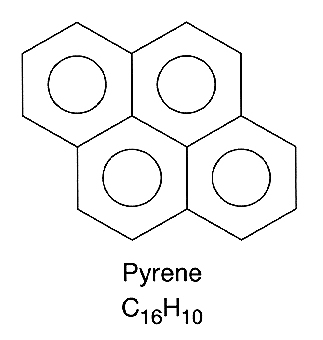 Aromatic hydrocarbons contain flat rings of carbon atoms, usually six carbons arranged in a hexagon. 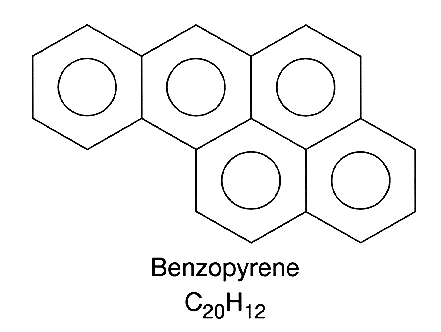 The simplest aromatic hydrocarbon is benzene, which used to be used as a solvent but can cause cancer. In the chemists shorthand, the benzene molecule is show here as a hexagon, with each corner representing a carbon atom. The circle in the hexagon symbolically represents some electrons that keep the ring flat. Each carbon here can attach to three other atoms. If a carbon atom (a corner of the hexagon) does not appear to connect to three other carbon atoms (corners), it actually does connect to a hydrogen atom, which isnt shown. 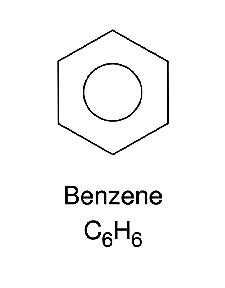 The aromatic character of benzene comes from the electrons that keep the ring flat; this is a much broader meaning of aromatic, which originally meant that these molecules stank. P -- Polycyclic. 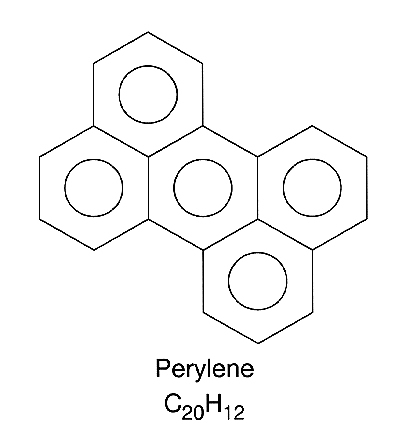 Polycyclic means that the molecules contain more than one aromatic ring like the benzene ring above. 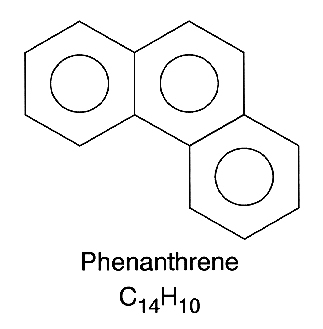 The simplest polycyclic aromatic hydrocarbon, with two joined rings is naphthalene. 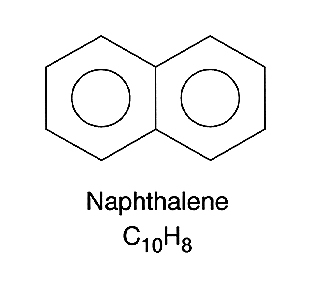 Naphthalene is probably the only familiar PAH; it is the active, poisonous ingredient in mothballs. Following naphthalene, more and more six-carbon rings can be attached in more and more complicated patterns to form different PAH molecules. 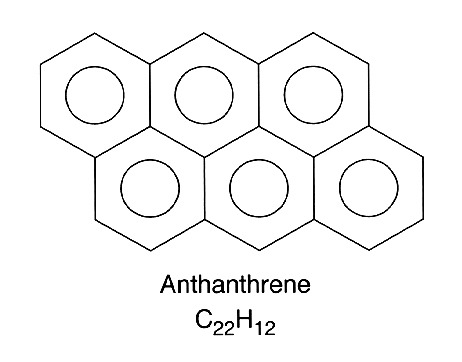 The few PAHs recognized in ALH 84001 include phenanthrene, pyrene, chrysene, perylene or benzopyrene, and anthanthrene. More Complications. Even more complicated PAH molecules are common on the Earth, but are very rare in ALH 84001. First, the six-sided rings can include elements besides carbon, most commonly nitrogen and sulfur. One sulfur-bearing PAH, dibenzothiophene, is common in the Earths atmosphere; most of it comes from burning sulfur-bearing coal and oil. Second, PAH rings and ring systems can connect to other organic molecular structures to make what are called alkylated PAHs. Here, one of the hydrogen atoms attached to a PAH ring is replaced by some other, nonaromatic, hydrocarbon molecule. Alkylated PAHs are common among the Earths PAHs, but are very uncommon in ALH 84001.